This is a lovely rainbow charm strung on a black waxed cord, presented on a card with the wording “Life Isn’t About Waiting For The Storm To Pass It’s About Learning To Dance In The Rain”. This would make a lovely token gift for anyone. Each charm is hand strung and knotted on 30cm of waxed cotton cord, making a beautiful simple bracelet to tie on as a token of love and friendship. 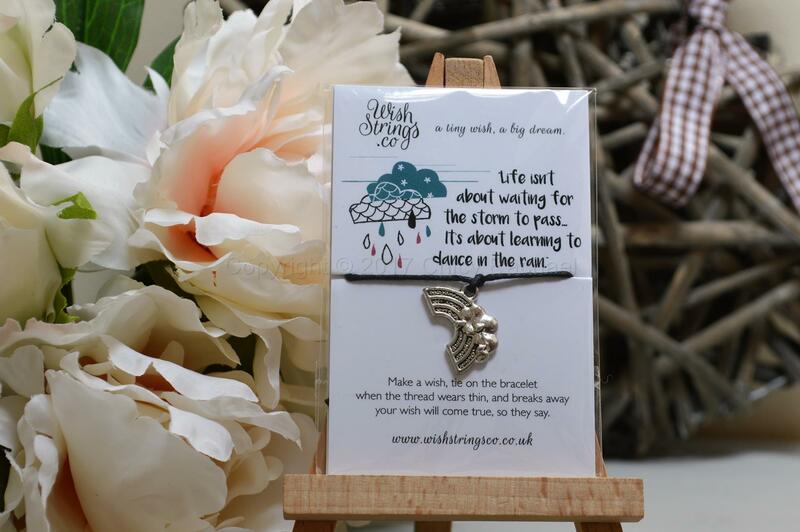 Each wish string is presented on a beautifully designed card with an inspirational saying, quirky graphics and empowering words. “Make a wish, tie on the bracelet, when the thread wears thin and breaks away, your wish will come true so they say”.